Flicking through a book I came across the sublime Madonna of Chancellor Rolin by Van Eyck, with that amazing depiction of Rolin, perhaps the earliest entirely convincing painted portrait, and immediately thought paper, rock, scissors. Not the most profound thought I’ve ever had. A little research seemed to suggest that this is the clearest example, amongst famous paintings, of Christ’s “peace” sign in the vicinity of praying hands. So I stuck with it. I was happy with this cartoon on two counts. One, you don’t need to know anything about art to get the joke. 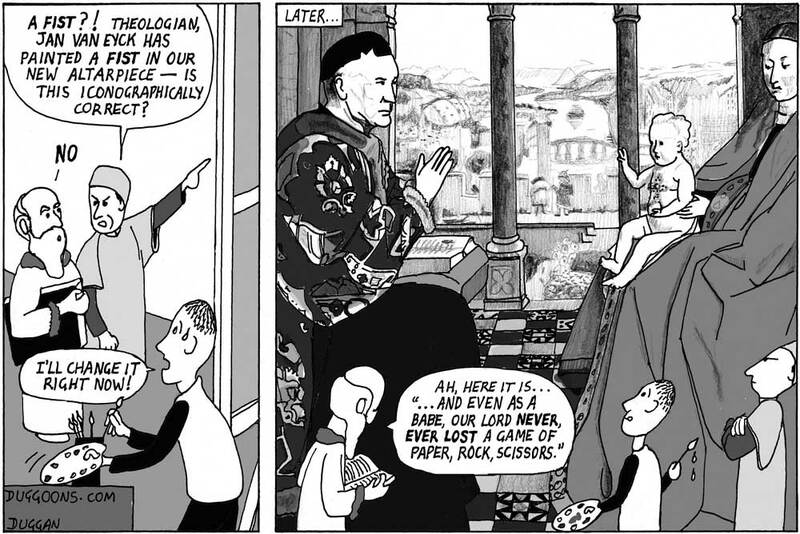 And two, the punchline isn’t given away by the image – you have to read what the theologian is saying. On those occasions when the image of the artwork is the punchline I always feel the readers’ eyes will naturally gravitate to it before they get through the set-up. Not telegraphing the punchline is the holy grail of joke telling. Simply make the punchline utterly unpredictable and you’ll get guffaws instead of chuckles. Now we can all get some sleep.